For most of the 1800s Portlanders made due with river, well, and creek water. Typhoid was an all too common cause of sickness and death as the 20th century approached. 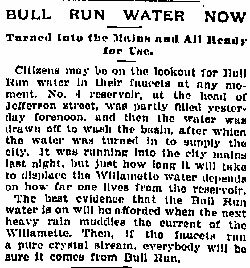 But on January 2, 1895 Bull Run Water began flowing through the city’s pipes, and typhoid largely became a thing of the past. Since the City of Portland has secured its water supply from Bull Run typhoid fever has become a very rare disease, and the few that are reported are among persons who have brought the disease with them from Seattle, or some other community notorious for a water supply vastly inferior to our own.